It's all her fault that I picked up this book. If you have not yet heard of this series and don't know the story, let me pass the enthusiasm along, if I may. 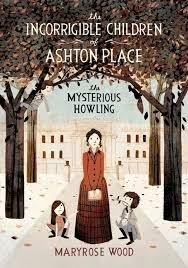 The Incorrigible Children of Ashton Place: Book I: The Mysterious Howling has us meeting Miss Penelope Lumley, a recent graduate from the Swanburne-Academy of Poor Bright Females. No one knows where Lumley came from and she, herself, is unaware of her past. She only knows that she is grateful to have been placed at Swanburne. One day she receives a job offers as a governess and, being that she has no family and no place to call home, she is sent out from Swanburne to Ashton Place, the home of Lord Fredrick Ashton and his new bride, Lady Constance. Lord Ashton likes to hunt and he found something rather unusual on one of his excursions - three small children. These children were raised by a pack of wolves and Lumley has been hired on to teach them how to be human and to know their Latin and Greek and all such important things. This is about all I can say of the plot without spoiling things considerably. Who are these kids? Why did they live in the wolves? Where are their parents? What shall be their future? Apparently I must get my hands on a copy of Book 2 post haste in order to come to a greater understanding! I'm hooked. And I'm here to tell you so. Care to join me in my agony of suspense? It's a curious tale told by Maryrose Wood. She has a lovely sense of irony in her writing which makes the book positively amusing as well as spell-binding. On the heels of reading The Jungle Books, I can note a certain degree of similarities, but the telling of this tale is unique enough to be enthralling. I'm going to annoy you with any further positive adjectives so I'll leave it at that. Get a copy! Join me on this quest to find out more about these incorrigibles. Thank you, Barbara? I think? I devoured them one after the other while pregnant with Benny. Cliffhanger?! I didn't know that. Now I need to round up the others. I guess I never mentioned the cliffhanger either. Oops! BUT I am anxiously waiting for December 7th...when the next book comes out. If I remember correctly, book 2 leaves more questions bc the story unfolds even more. Sorry about that...:-D I've read the second and third in the series and some of those questions raised in the first book are still unanswered, with a fourth book due out in December. I'm not sure how many books the author has planned, but I'd rather have the series be tightly written and wrap up in a short series than to drag on for several books before we get the first questions answered. Each book is enjoyable, though, and so cleverly written. If you have a chance to get your hands on the audiobook narrated by Katherine Kellgren, grab it. She is easily one of the best audiobook narrators I have ever heard. I got the first one for free via Sync (http://www.audiobooksync.com/free-sync-downloads/sync-schedule-13/) - they release a free audiobook each week during the summer - and I was hooked. Well, I AM glad to have come in late enough to have four books out. That'll buy me some time. @Diary of an A - there is something to that, yes! I have this on hold at the library right now (from the mention on the last Nightstand link-up)... guess I should just order book 2 now as well!